OCTOBER 2018 • FOODSERVICE EQUIPMENT & SUPPLIES • 49 "Who wrote the rule that there is an age requirement to be success- ful in the foodservice industry? Where are future generations going to come from?" 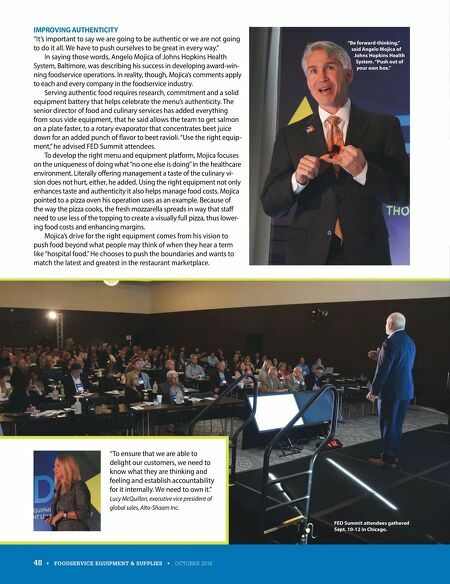 Steve Spittle, group president, commercial foodservice segment Pitco and Blodgett Divisions, The Middleby Corporation "Kitchen connectivity is key to the future kitchen." Markus Glueck, executive vice president, RATIONAL North America Ray Chung of The Johnson Studio and Leonard Condenzio of Ricca Design Studios. Christina Collins of Burkett Restaurant Equipment & Supplies brainstorms with Brian Holdrich of Welbilt. Left to right: Andy Wueste, Mission Restaurant Supply; Angelo Mojica, Johns Hopkins Health System; and Todd Griffith, Alto-Shaam. 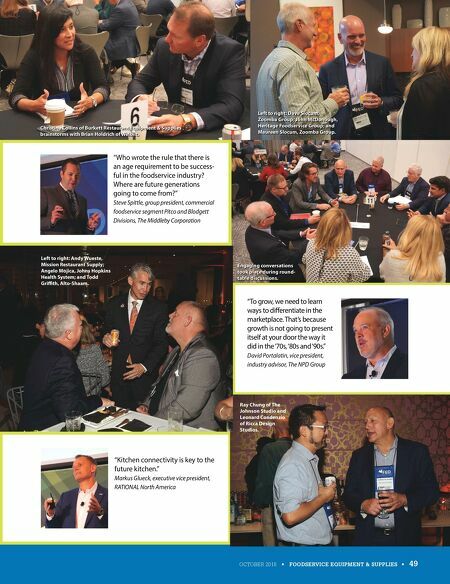 Engaging conversations took place during round- table discussions. "To grow, we need to learn ways to differentiate in the marketplace. That's because growth is not going to present itself at your door the way it did in the '70s, '80s and '90s." David Portalatin, vice president, industry advisor, The NPD Group Left to right: Dave Slocum, Zoomba Group; John McDonough, Heritage Foodservice Group; and Maureen Slocum, Zoomba Group.